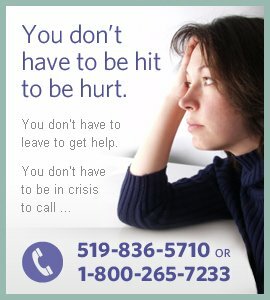 The Crisis Line is a 24-hour telephone and TTY support and referral line in Guelph and Wellington County. Volunteers offer support to those who have experienced or are experiencing physical, sexual, emotional or financial abuse and/or stalking. We also speak to concerned friends and family members of abused women, service providers and other professionals in contact with abused women. Training is provided. Provide childcare while the women are attending a group or using one of our other services or assist staff in the shelter with fun activities for children of all ages. Provide support and advocacy to women using our program services. Accompany women to hospital, court, police station or other appointments. Assist our public educator in preparing and delivering presentations, displays and information tables and materials to community members within Wellington County. You can also help plan special events such as Take Back The Night, December 6 Vigil and International Women’s Day. This position is open to men, women and youth. Join our Fundraising Committee and take part in organizing and participating in our fundraising events (like our Annual Dinner and Auction). Many of our services rely on fundraising. This position is open to women and men. Answer our office phones for general inquiries or assist with other administrative tasks in our various program areas and locations. Keep our shelter and grounds looking beautiful! Assist with the inside and outside upkeep of the shelter and program properties. These volunteers can also help pick up and transport donations. This position is open to women and men.